I love this kiddo’s innocent take on things. Like her question about why tacos are called tacos, anyway? Do they make you talk a lot? You would think her innocence would make her a prime candidate for roasted Brussels sprouts. No preconceived notions, no experience with overly-boiled orbs, nothing. But no dice. Our kiddo loves broccoli, thank goodness, but regards every other vegetable (and fruit, for that matter) with the greatest suspicion. More for us, I guess. 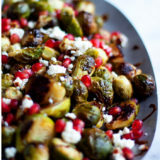 But dang, these Roasted Brussels Sprouts with Pomegranate & Feta are insanely delicious, and she is truly missing out. 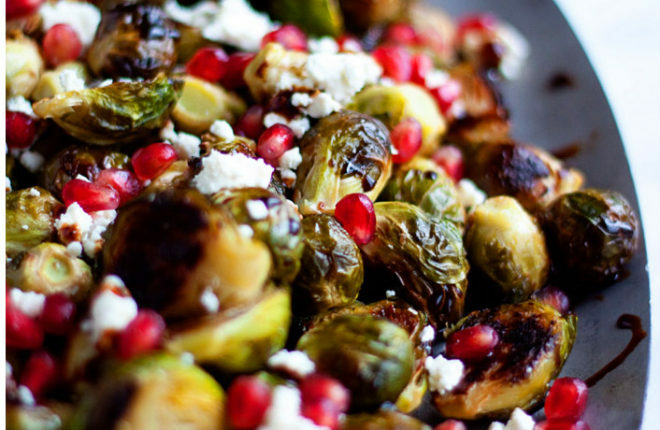 Roasted Brussels sprouts are pretty much my jam. I discovered them years and years ago after watching an episode of Martha Stewart Living in which they were roasted with an inordinate amount of butter. SOLD! I’ve since switched to olive oil as my roasting medium of choice, and honestly, roasted Brussels sprouts with a good bit of salt are pretty much where it’s at. I think it was a few years later I was watching an episode of Barefoot Contessa and the veritable Ina said that Brussels sprouts should be salted liberally like French fries. If Ina says it, it must be true (it is). Moral of the story: I watch too much TV. Anyway, even though straight-up roasted Brussels sprouts are the best thing ever, sometimes, those Brussels need a little muscles. As in, a little flair. Am I making any sense?! Toppings, I mean, man, toppings! In this case, we’ve got the festive red-and-green vibe of the season – we’re talking pomegranate seeds, a drizzle of pomegranate molasses, and a crumble of feta (though you can leave the feta off if you’re vegan, they’re still great). 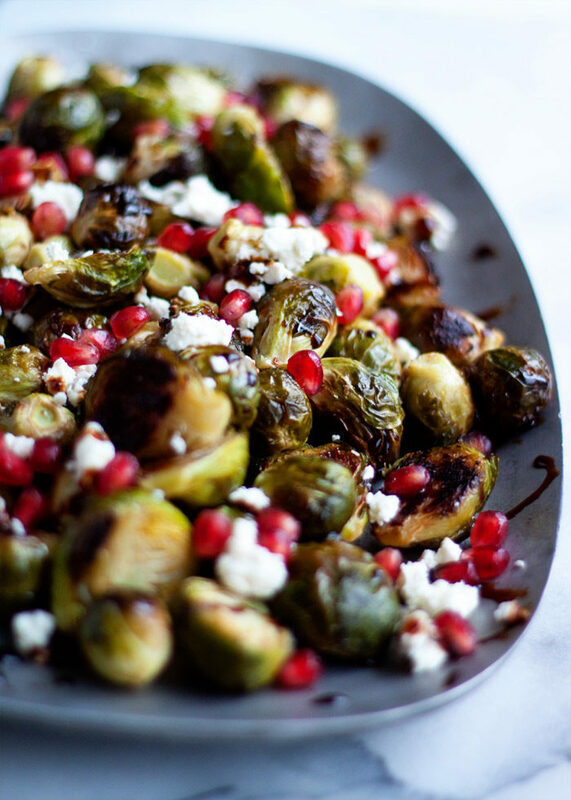 Basically these Roasted Brussels Sprouts with Pomegranate & Feta are the perfect veggie side dish for the holidays. Sweet-and-salty roasted colorful goodness. What’s not to love? Prepare sprouts. First, rinse them well, then cut any brown ends off of the bottom and remove any shriveled or brown leaves. 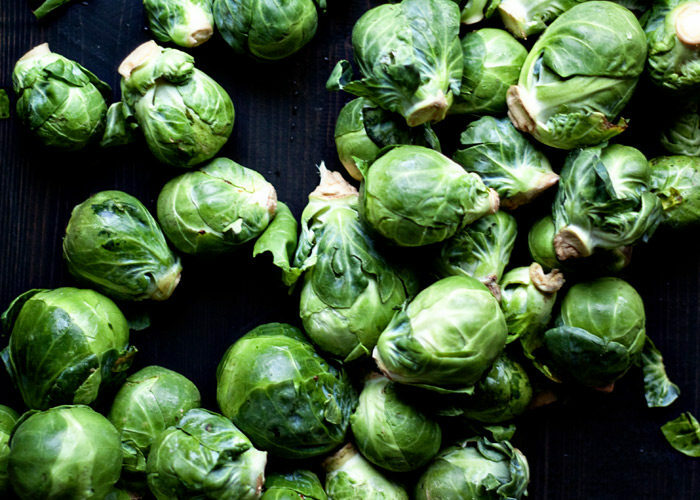 Cut larger sprouts in half so that all pieces are roughly the same size. Rinse and shake off excess water. 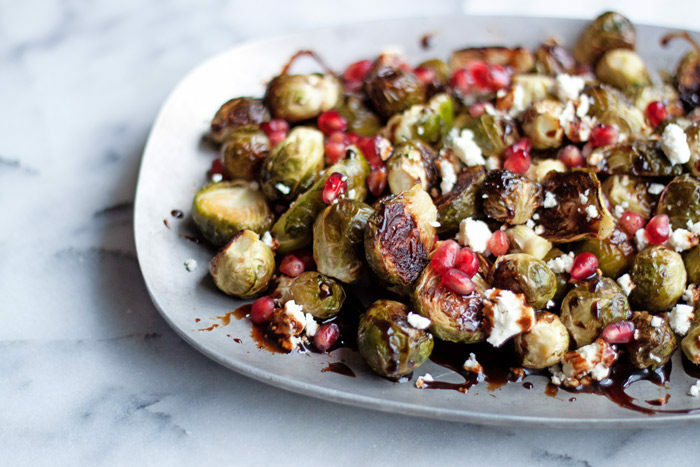 Pour sprouts onto a large rimmed baking sheet, drizzle with the olive oil, and toss gently until well-coated. Sprinkle with 1/8 teaspoon salt. Bake, turning every 10 minutes, until tender and browned, about 30 minutes. Remove from oven and arrange on a plate. 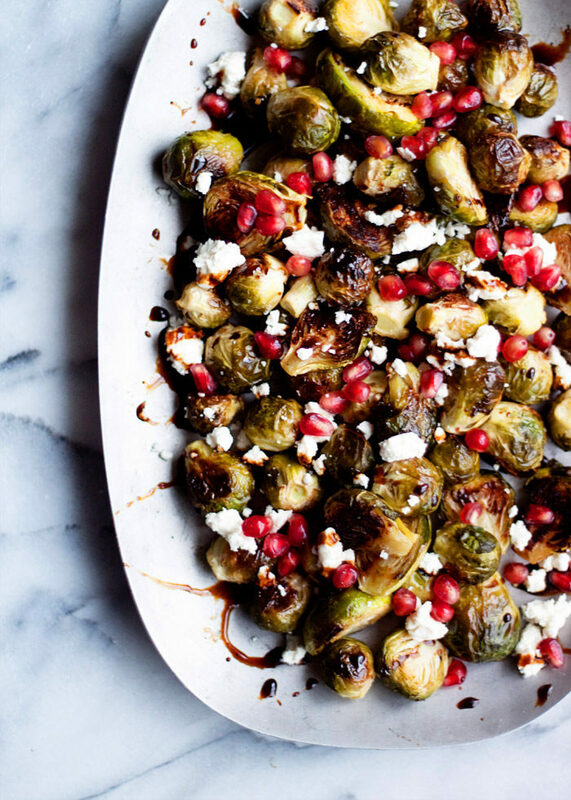 Sprinkle feta and pomegranate seeds over the top, then drizzle with the pomegranate molasses. Taste and add additional salt if desired. Serve.